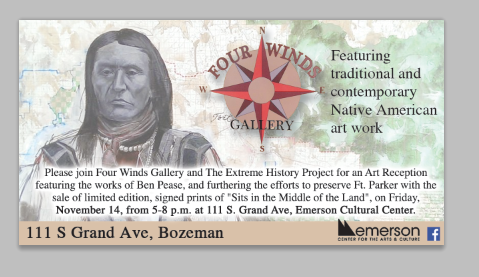 Four Winds Gallery features Ben Pease and Print Sale for Fort Parker! Help support the purchase of Fort Parker by the Archaeological Conservancy. Purchase a limited edition print of Sits in the Middle of the Land by artist and Fort Parker descendant Ben Pease at the Four Winds Gallery in the Emerson Center for Arts and Culture. Join Ben for a reception at the Gallery on November 14th from 5-8. Honoring the Centennial of Woman’s Suffrage in Montana!